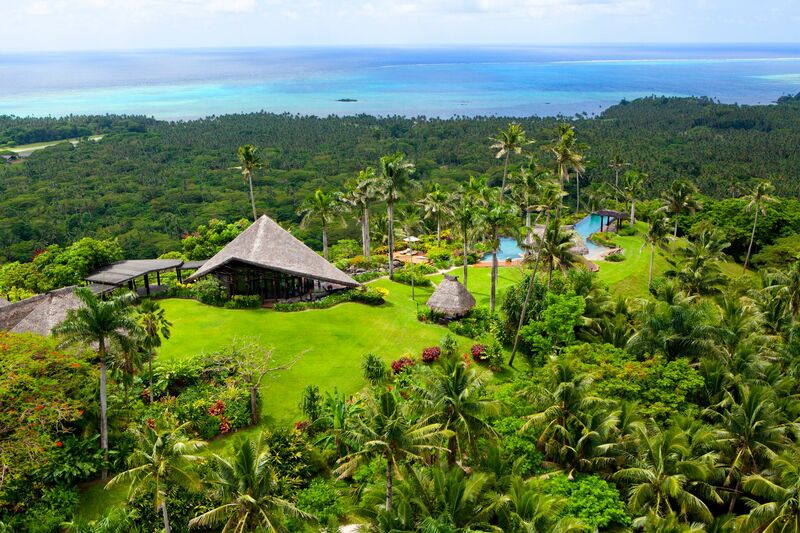 The Hilltop Villa is likened to a “resort within a resort,” situated atop the high green hills of the island, shining as the crowning gem of Laucala. 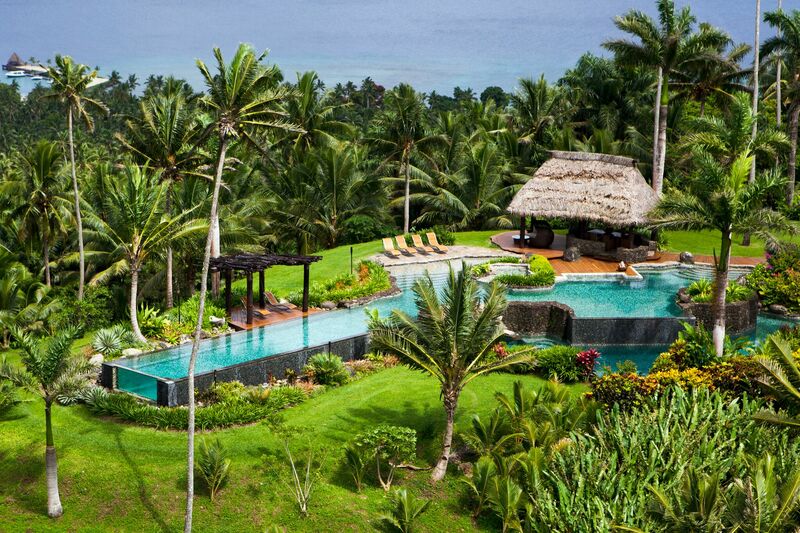 The captivating views, unique atmosphere, and unusually designed main villa with its own panoramic view, landscaped garden and two spacious guest villas all work together to form one oversized private “estate” on the hilltop. 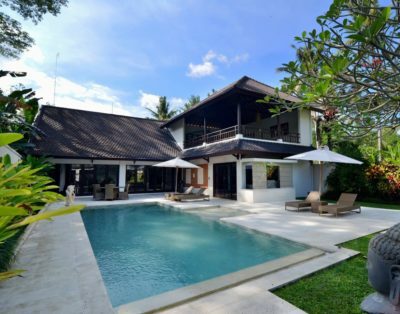 The main villa features a master bedroom, lounge, dining room, library, outdoor pavilions and lap pool, and two one-bedroom guest villas feature one separate pool and private kitchen area. Romantic candlelight dinners on the private beach, fine dining in the Plantation House Restaurant, authentic Asian delicacies in the Seagrass Restaurant, spectacular sundown cocktails in the Rock Lounge, avant-garde finger food at the Pool Bar and barbecues at the Beach Bar all capture the tropical atmosphere and provide a broad variety of culinary rarities that fulfill every wish. A superbly stocked wine cellar on property acts as a treasure trove for the most discerning of oenophiles. available by land and boat, offers a perfect combination of top-quality cuisine á la Laucala Island with a distinct Thai touch. 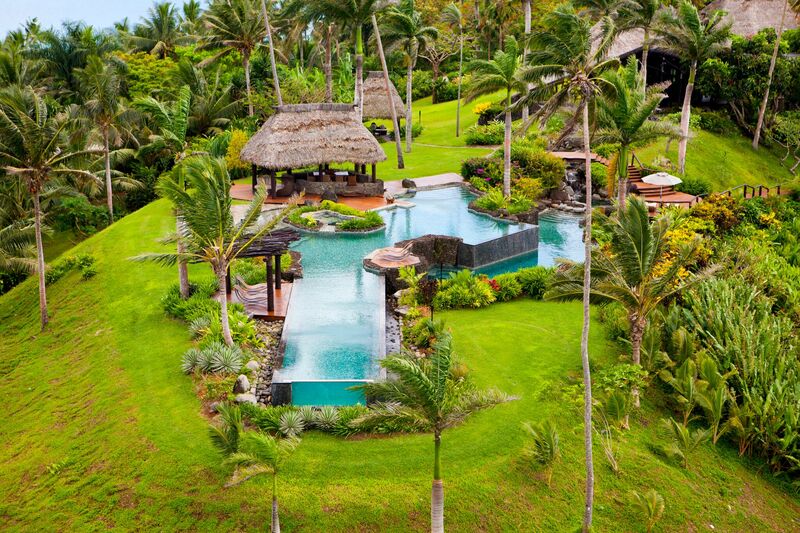 Set against panoramic views, with a sensuous atmosphere, specialties include Teppanyaki barbecue and authentic Asian dishes, introducing a taste of the Far East to Laucala Island. 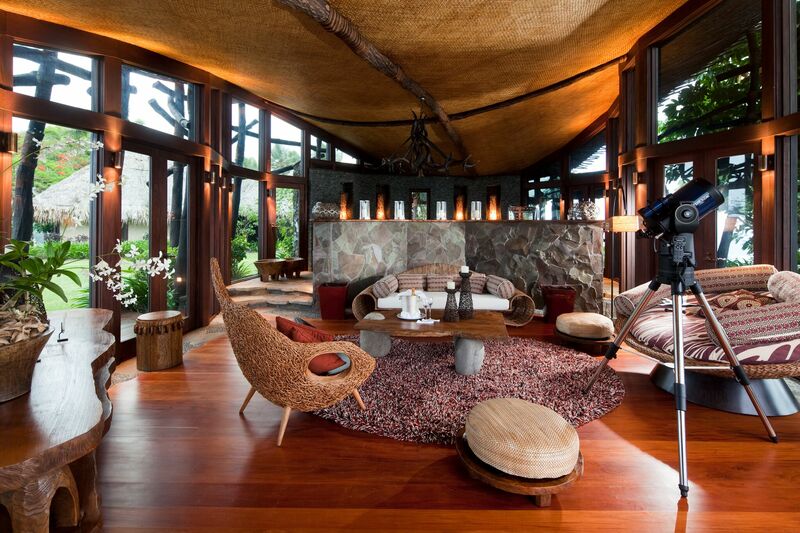 provides a Fijian avant-garde experience where imaginative design in the form of off-the-wall architecture combines with tropical drinks and light, modern Mediterranean cuisine. offers a relaxed atmosphere where fine white sand, blue sunny skies, crystal clear water and freshly caught and barbecued fish come together, creating the perfect beach setting. 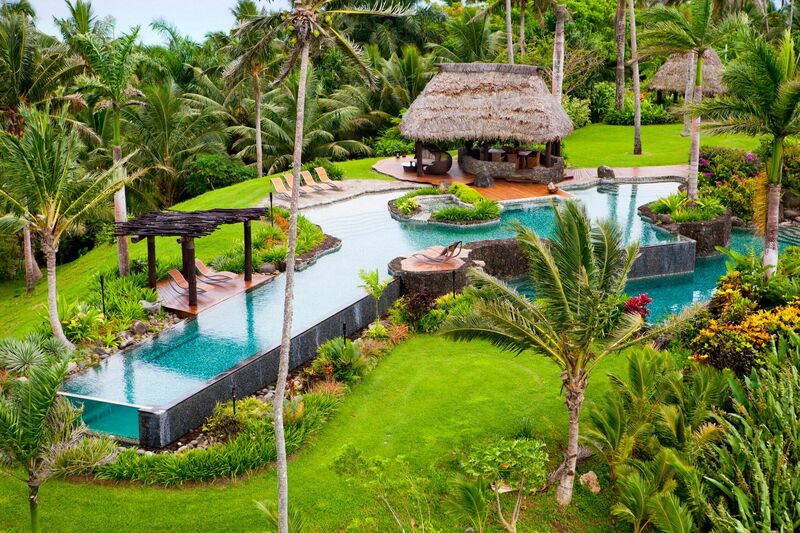 Laucala Island is perhaps best known for and enjoyed as, a kaleidoscope of sporting and cultural activities for guests of all ages. 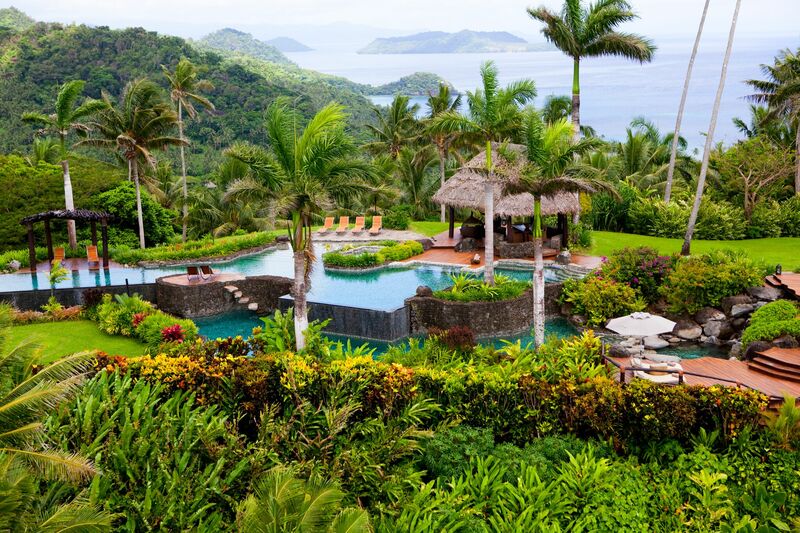 From diving in a unique underwater world to golfing on an 18-hole championship course, to meeting indigenous artists, everything is possible on Laucala Island. 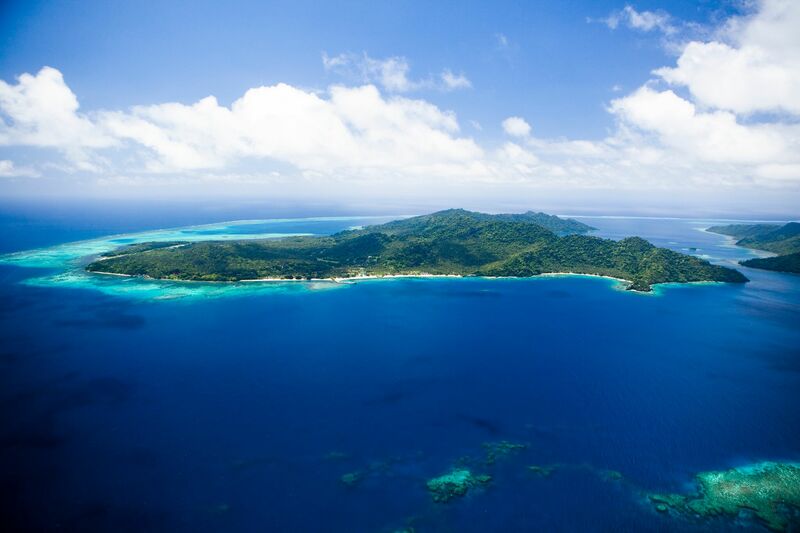 The Laucala Island Watersports Center is equipped with sophisticated sports equipment for guests who wish to experience kite-surfing, sailing, diving, snorkeling or jetskiing. The center additionally has its own fleet of vessels such as the elegant Riviera Open Flybridge, along with 13 other sporting boats. 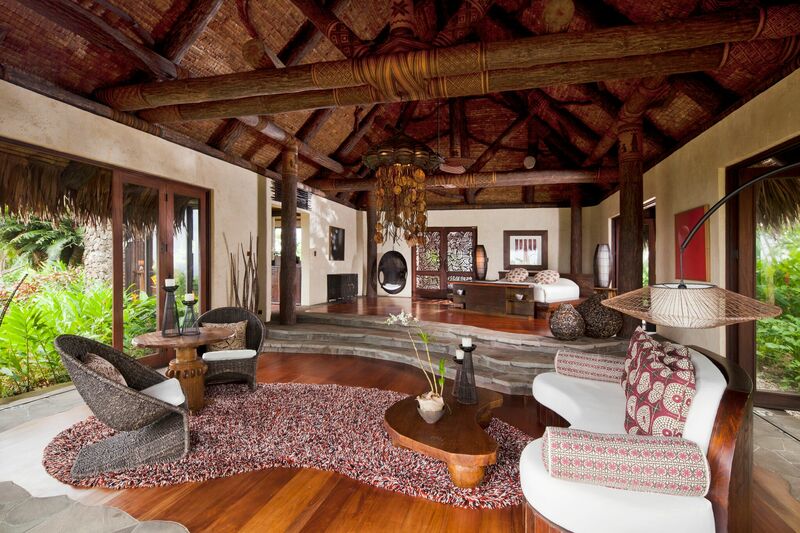 25 minutes from Laucala Island by jet boat, surfers will find the perfect spot to enjoy all year round. Wainimaqai has the advantage of being for left and right hand surfers. We provide boards from beginners to expert level. Our surf guide is available anytime. 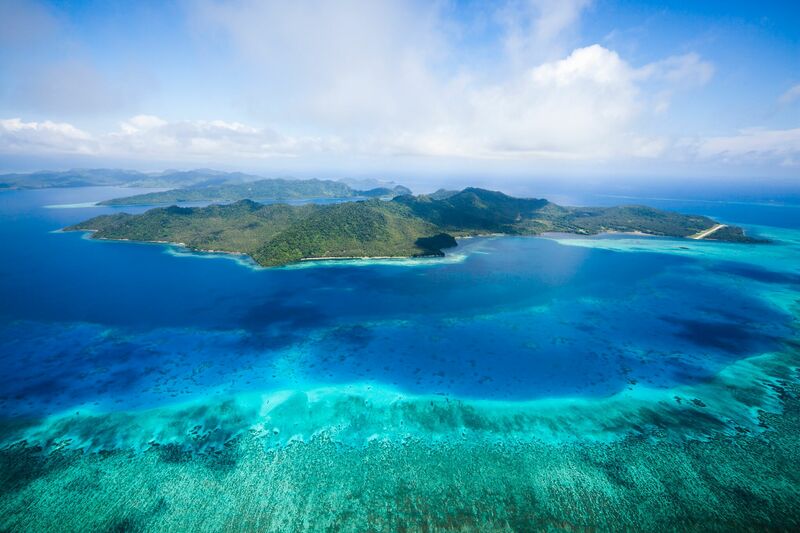 The variety of coral reefs and incredible profusion of large and small fish captivate both deep-sea divers and rookie snorkelers. The experienced team of the PADI accredited diving base offers a wide range of courses from open water accreditation to certification of night dives, guided snorkeling trips, wreck-diving and underwater photography classes.For those who prefer not to get wet, we also offer a one of kind underwater experience in 1 of only 3 state of the art 2 person winged DeepFlight submersible crafts in the world. Riding horses along the fine, sandy beach, through plantations and coconut groves is so magical as to stir the emotions of experienced horsemen as well as beginners. The island has eight horses and provides safety helmets and vests along with a fenced-in riding arena. 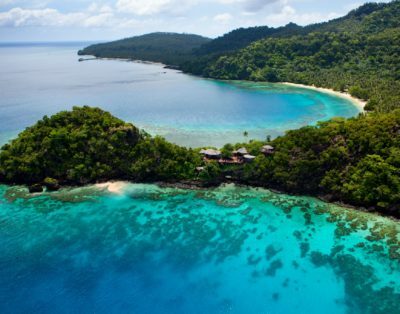 Laucala Island’s Cultural Village is one of the few traditional villages left in Fiji and is designed to preserve and showcase local traditions, culture and architecture to guests. The main buildings are the Bure Kalou or temple house, as well as the village hall and the Chief’s bure or hut. Here, guests can experience our Lovo night featuring a variety of delicious local cuisine cooked in an earthern oven and also discover Kava ceremony with our staff, listen to Fijian songs and chants while being entertained by local village traditional dancers. You can participate in Fijian arts and crafts like mat or handicraft weaving, wood carving and Masi or Tapa making and printing. A chapel is also available a few steps from our traditional village for wedding celebrations. From treadmills and bikes to elliptical and rowing machines, the cardio equipment in our Fitness Centre is state-of-the-art. A range of weight machines and free weights are complemented by a stretching area, yoga mats and pilates gear. A personal trainer is available daily. 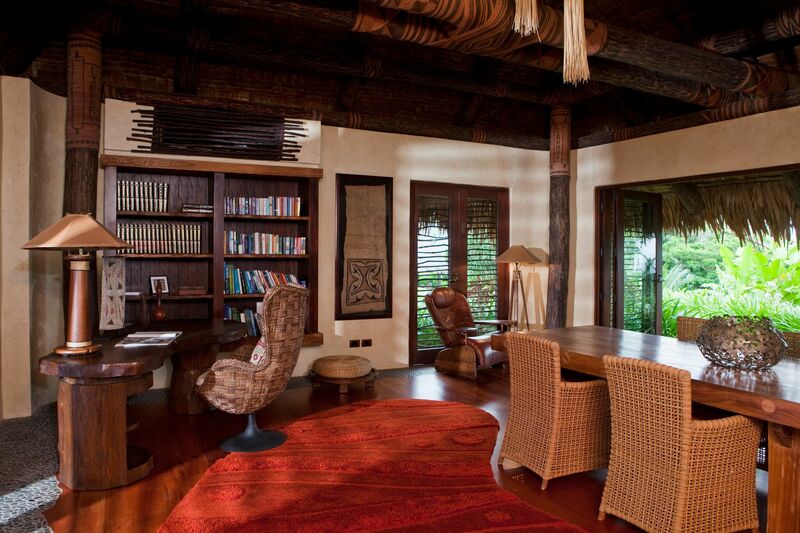 Set beside our lagoon-style pool, the Leisure Centre is home to a thoughtfully curated library with reading materials ranging from popular fiction to reference books about Fiji and the South Pacific. Browse a tome over a drink or talk to the centre’s helpful Concierge team, on hand to assist you arrange everything from island excursions to spa bookings. 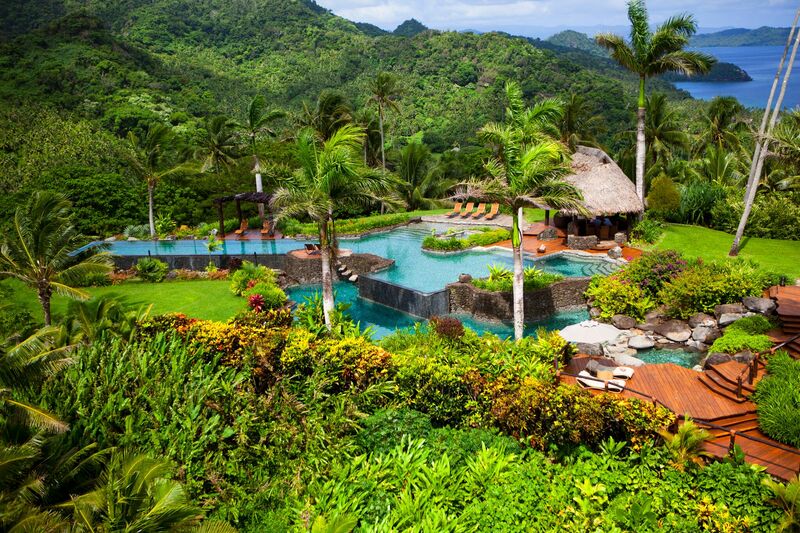 The Kids Club offers an educational and fun experience for toddlers to early teens, providing unique experiences, such as a map to discover Laucala Island’s treasures or a compass and disposable camera for exploring. Kids can paint, learn how to carve wood, play on the beach’s large sandpit or even attend a bubble-making dive course. Additional activities include kids’ mountain bikes, tennis, pony rides, various water activities and golf. The island features its own farm, where 240 acres make up a farmland to organically grow crops and raise animals that provide the majority of products needed on the island and can be prepared in-house. Crops include vanilla, pepper, teas, tropical fruits, a wide variety of vegetables like lettuce, tomato, cucumber, zucchini, eggplant, cabbage, broccoli, cauliflower, okra, string beans and animals such as chickens, cows (including Wagyu), pigs, quails, Peking ducks, goats and coconut crabs, all grow splendidly at the farm. 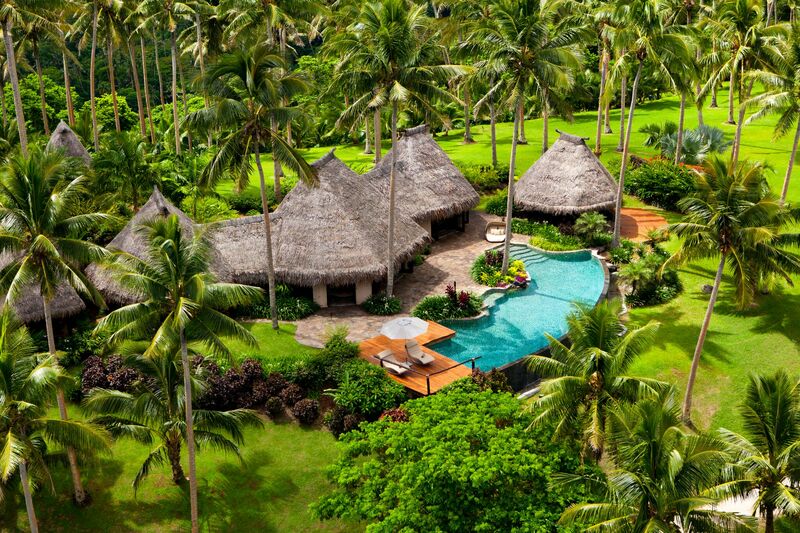 In the South Pacific region, the coconut palm is truly the tree of life, supplying food, building materials, medicinal and beauty products. 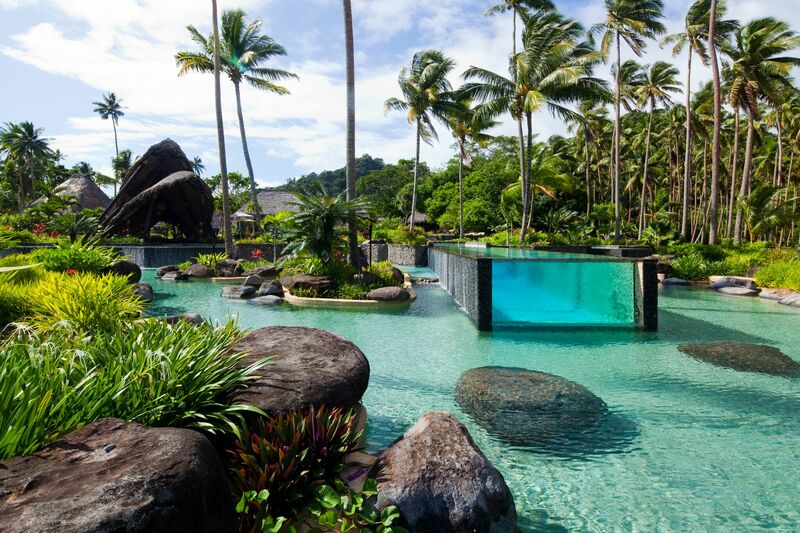 With more than a quarter of the island covered in coconut groves, its versatile products shape every visit to Laucala Island, used as a source of shade, an ingredient for cocktails, culinary refinement or an ingredient for homemade wellness products. The 18-hole championship golf course is set against the mountain and integrated into the old plantation area, where undulating fairways and challenging greens with strategic bunkers ensure a well-balanced course. PGA professionals are available to assist golfing guests. The golf course was designed by Scotsman, David McLay Kidd, renowned for his award-winning Bandon Dunes in Oregon. The par 72 layout offers a variety of tee box options which create the perfect balance for golfers of all skill levels, challenging to the more accomplished player, yet fun and welcoming for beginners. 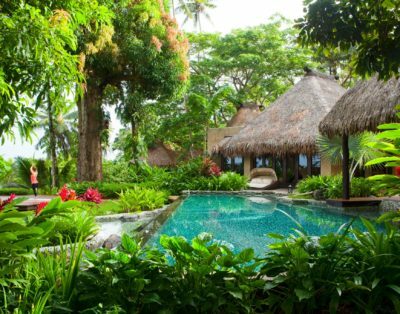 Laucala Island’s spa experience is unlike any other, offering treatments that translate into enchanting, once-in-a-lifetime moments in a true island paradise. 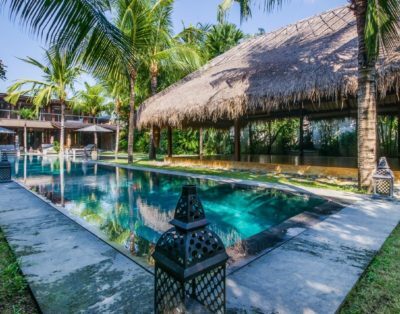 The spa features four couple treatment villas, each with a private treatment room, hot stone relaxation room, outdoor bathtub, and private changing room. Facial treatments, Body treatments and rituals, massage therapies, and salon services are all available. 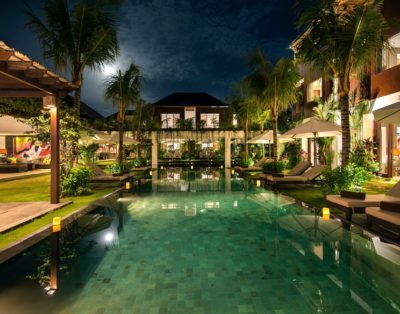 The spa additionally features two wet treatment rooms, Vichy shower and steam rooms, along with a beauty salon, pedicure and manicure rooms and a spa garden. In each of the Spa Suites, wellness experts strive to open up the energy centers of the body while allowing the soul to rest on cloud nine. 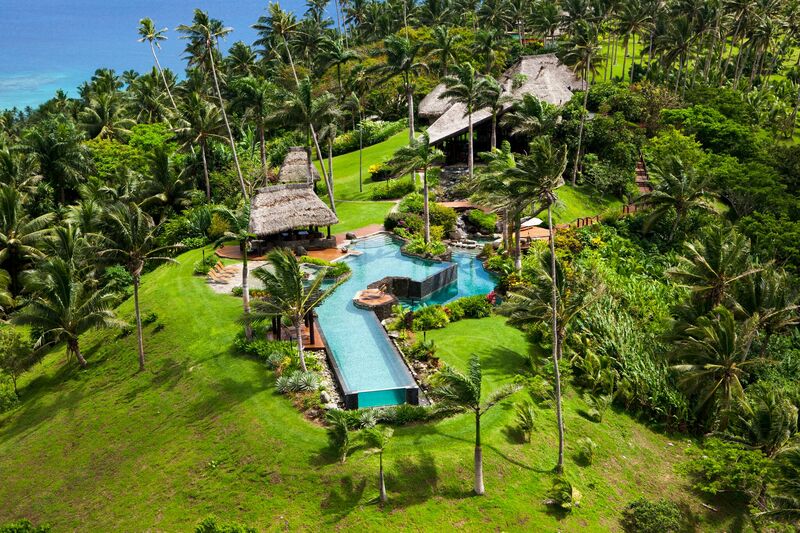 The spa incorporates the natural resources of the island, best exemplified in our four signature scents – Molikaro (native citrus trees), Wainimate (herbal medicines from curing botany), Senikau (tropical blooms) and Qele (indigenous roots, woods and spices). 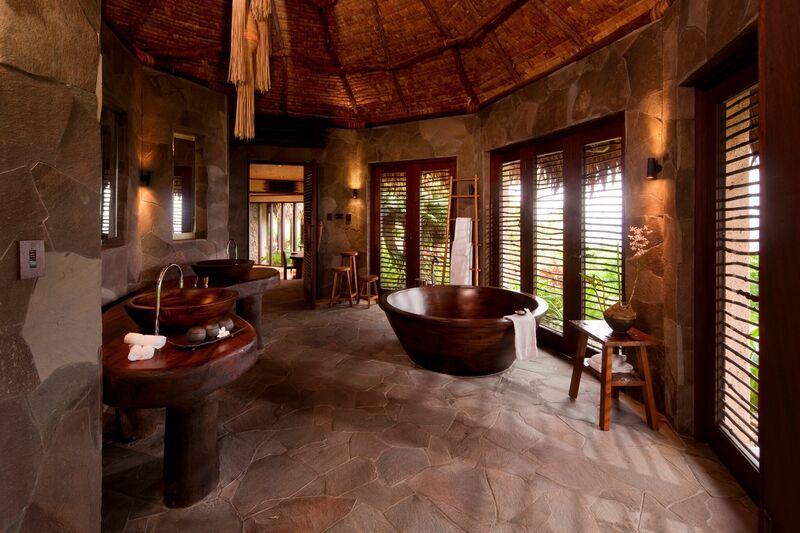 Each scent is integrated into the bespoke Spa Journeys. 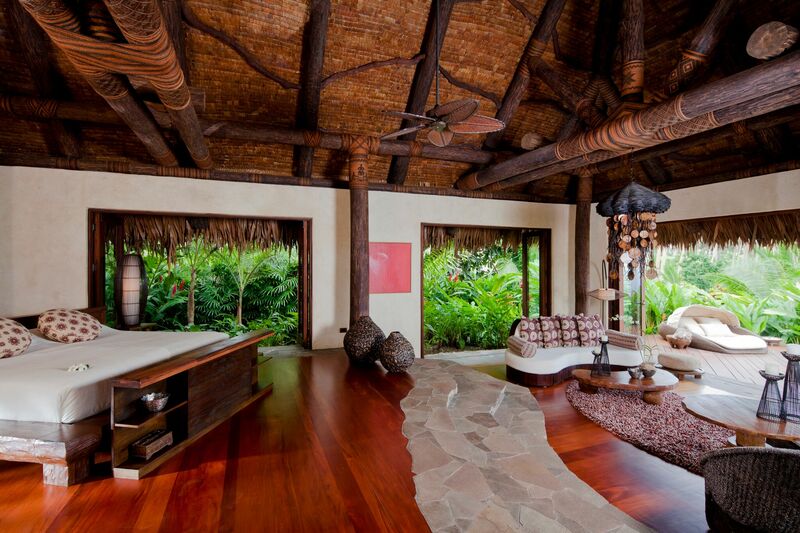 are offered on the spa menu based upon tradition rituals that combine South Pacific traditions and modern techniques. 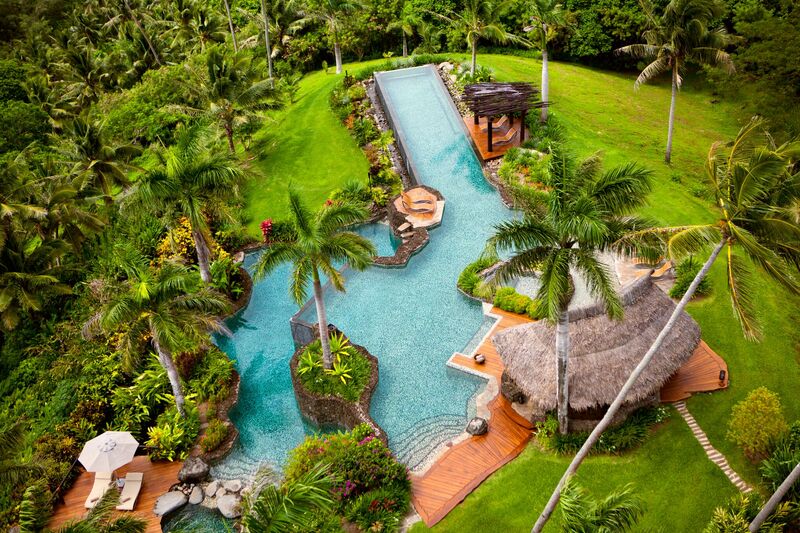 Choices range from Fijian hot and cold river stone therapy to island volcanic scrubs to mineral crystal therapy. 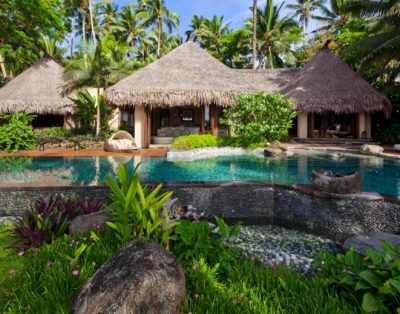 is located in the heart of the spa, and through an interactive display, guests are able to explore and learn about Fiji’s tropical flowers, herbs, spices and fruits. All ingredients are implemented in the spa products. Guests are offered the chance to create their own essential oil in the resort’s distillery. The florist’s pavilion allows guests to create their own bouquet, and provides a guide to navigating the flower, herb and vegetable patch, as well as the coconut oil press. offers hands-on experience in making candles, soaps, body lotion and bath bomb lessons. Horseback riding, Tennis, Mountain bikes, Fitness center, Yoga, Cooking classes, Spa classes, Kids club, Cultural village, Nature Walks and Trails. A 30% deposit at the time of booking AND the signed Indemnity, as well as the Waiver forms, are required to confirm all reservations. 70% of the remaining balance is due one month prior to arrival, non-refundable. For short leadbookings (received less than one month prior to arrival), 100% payment is due at the time of booking, non-refundable. All additional incidental charges incurred during the stay to be settled by the guest upon checkout, unless otherwise specified. To avoid additional hidden charges we would encourage direct bank to bank transfer payments. Cancellations less than three months prior to arrival are non-refundable, including any amount received, however, credit will be applied to any future booking within 12 months.